If you are in business and you are in South West Herts then when it comes to Networking you are spoilt for choice. If you take a quick visit to the Networking page on here you will see exactly what I mean... and I am guessing there are one or two missing as well. You will see on that page we have put together a Networking Calendar for the area this enables all the different networking groups to add their events into a single place (if they choose too). As a business owner wanting to Network in the local area that makes much more sense to me... I can look in one place and plan accordingly. This post we are going to focus on a group that meets twice a week in the Garston / Leavesden area of the SW Herts District. They meet at the Watford Indoor Bowls complex which is nestled behind the Watford Leisure centre. 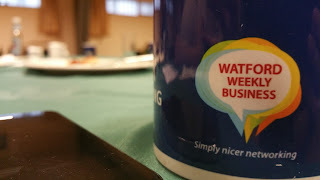 This group is called Watford Weekly Business. Watford Weekly Business have no affiliation to any other Networking groups (independent) and meet twice weekly on a Wednesday and Friday mornings from 7-9am. The format of the meetings is loosely on a proven formula but as the group is run for the benefit of the members the meetings are more flexible than many. Although attendance each week is encouraged the group is far more understanding in that we are people first and lives come before a networking breakfast.